This article was originally published in the October 2015 print edition of Ottawa Magazine. The above photo — cropped to fit, but which is shown in full, below — is “Carry weight,” taken by artist Nichola Feldman-Kiss. It is part of the exhibit, witness, which opened in October at the Ottawa Art Gallery. Is there a place for human remains in an art gallery? Paul Gessell talks to curators, academics, and ethicists — as well as an artist whose work includes a skeleton purchased online — about exhibitions that raise moral issues concerning consent. Artist Nichola Feldman-Kiss received a macabre parcel in August 2014 from the British Columbia medical supply company Osta International. The package had cost more than $4,000 and was purchased on an instalment plan, the last payment being a birthday present from her partner. Struck by conflicting emotions, Feldman-Kiss waited six months before opening the box to view a human skeleton that, come October 2, is to be part of the exhibition, witness, at the Ottawa Art Gallery (OAG) curated by Catherine Sinclair. Feldman-Kiss’s mid-career retrospective includes works both old and new in several different media born of the artist’s long-standing interest in issues surrounding the body, identity, and colonization. 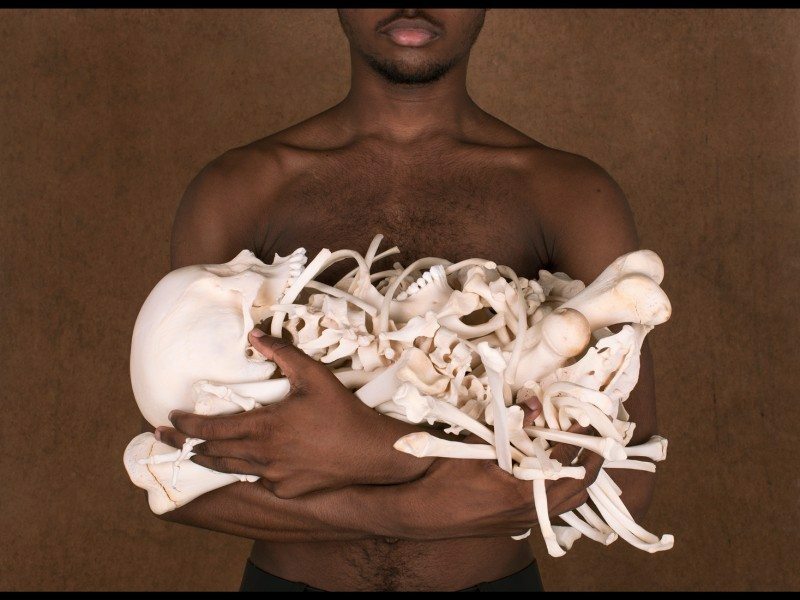 The skeleton will be part of an installation called Between Here and There. It will be “in your face,” “over-lit,” and actually “painful on the eye,” says the veteran Ottawa artist who currently lives in Toronto. However, some viewers may feel pained — not because of the bright light but because of the ethical red flags shrouding this unusual installation at a city-financed gallery. Is everything permissible in art? Or have the gallery and the artist gone too far, broken some taboo? An array of curators, ethicists, anthropologists, and academics were interviewed before the opening of witness. Many wished the skeleton would not be exhibited, especially when the origin of the bones is unclear. But how to define “respectfully”? Are Feldman-Kiss and the OAG being respectful? Recent examples include bones in this past summer’s Greek exhibition and previous shows with Haitian skulls, Egyptian mummies, and preserved European bog people. Consent was sought from the relevant governments. As well, in the case of the bog people and the Haitians, local Algonquin elders held ceremonies to welcome the spirits the deceased. As a child in the 1960s, I frequently visited the Royal Saskatchewan Museum in Regina, where an exhibition revealed a cross-section of a real carefully unearthed grave, including the skeleton of an Aboriginal child. I can remember feeling I had no right to view this child’s remains. As an adult, I had a similar reaction in 2002 when the institution then called the Canadian Museum of Civilization exhibited the mummified bog people. And now I will be approaching Feldman-Kiss’s skeleton installation with similar discomfort. Osta told Feldman-Kiss only that the bones were “Asian.” She initially suspected India because that was the centre of the international bone trade until 1985, when exports became illegal. A greatly reduced trade has moved underground, and China has picked up much of the business. Armed with grants from the Canada Council for the Arts and the Ontario Arts Council, Feldman-Kiss did extensive research in India on the human bone industry. While there, Feldman-Kiss showed Vinesh Aron, a merchant of medical education materials, a photograph of the skeleton she had purchased. Aron thought it must be from the Indian city of Patna. But five months later, when Aron visited Feldman-Kiss in Toronto, he examined the actual bones and said he believed they were from a variety of people in Taiwan, with the pelvis being female and the femurs male. This patchwork approach is common among companies selling osteological specimens. So it would seem that the skeleton is not an “individual” but many people. But who were they? Did they consent to have their leg or pelvic bones bought and sold? Did any of them give consent for their bones to spend their afterlife as an art exhibit? The OAG took some unusual steps in advance of witness, including consulting the gallery board, a lawyer, and medical ethicist Dr. Jeff Blackmer, vice-president of medical professionalism for the Canadian Medical Association. “I don’t have a fundamental concern with this as long as people attending are made aware of the context and the potential controversies,” Blackmer said in an interview. But to some people, the most important question is whether, to make her point, it was necessary to purchase, exhibit and, essentially, enslave human remains of dubious origins.